This is in proper “I can’t stop looking at how hot my nails are” territory. 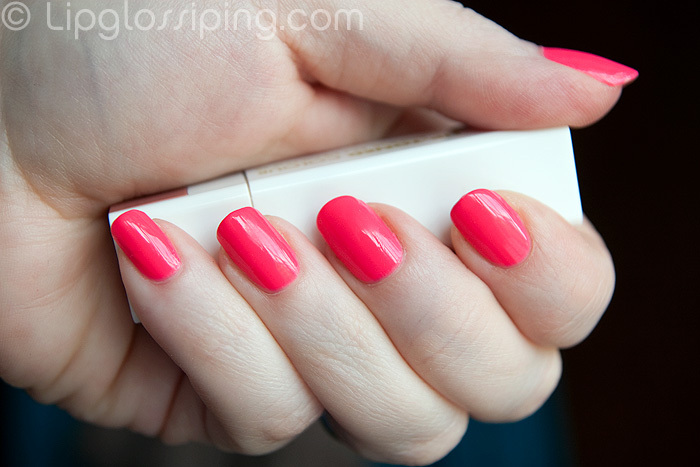 A neon pink creme that lends itself fabulously to slightly cooler toned ladies. This is three coats. Application was fine if a little bit patchy. I couldn’t have gotten away with less than three coats despite it’s apparent opaqueness. You would also be wise to pair this with a topcoat as it dries somewhat matte. All in all, there’s a few niggles… but it didn’t make me want to tear my hair out with frustration or anything extreme like that… and the colour… OH the colour. I lurve. Woodstock is from the Urban Decay Summer of Love collection which is supposed to be released on the 7th June in the UK, but I’ve heard a few people say that it’s already available in Boots and Debenhams. Oooh it’s so beautiful. My favourite shade of pink! I need to check out Debenhams asap! love this! i need to get this collection. I love it! Such a lovely colour. This colour looks stunning! I’ve never been one for nail polishes but lately I seem to have developed an obsession. I might get this set when it comes out!